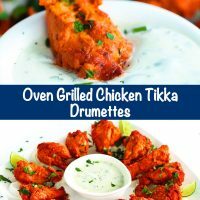 These Oven Grilled Chicken Tikka Drumettes are the perfect snack for game day or appetizer for house parties. 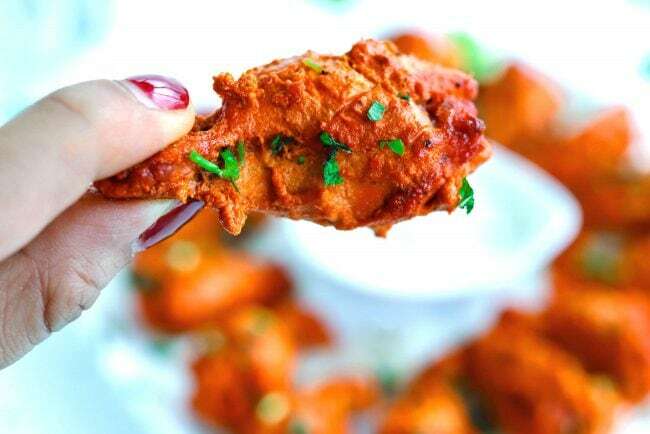 They’re easy to make, healthier than your average chicken wings, and incredibly flavorful! 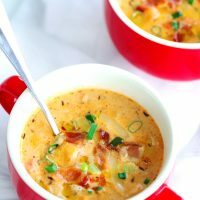 In honor of March Madness and the Premier League this month, I’ve decided to share some of my BEST game day snacks & appetizers recipes with you! We kicked off last week with this show-stopping, super tasty, fusion Thai Sweet Basil Roasted Tomato Salsa, which you guys loved so much over on Instagram! 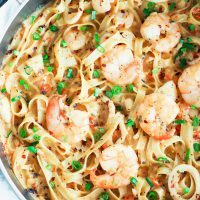 And this week, we’re moving onto one of my most popular and favorite recipes EVER! 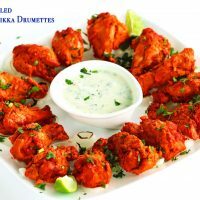 I present to you this luscious beauty – Oven Grilled Chicken Tikka Drumettes! 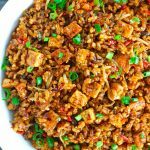 Easy – they’re super easy to make and involve just a few simple steps! Make the marinade and marinate the chicken, cook them in the oven, garnish, and done! 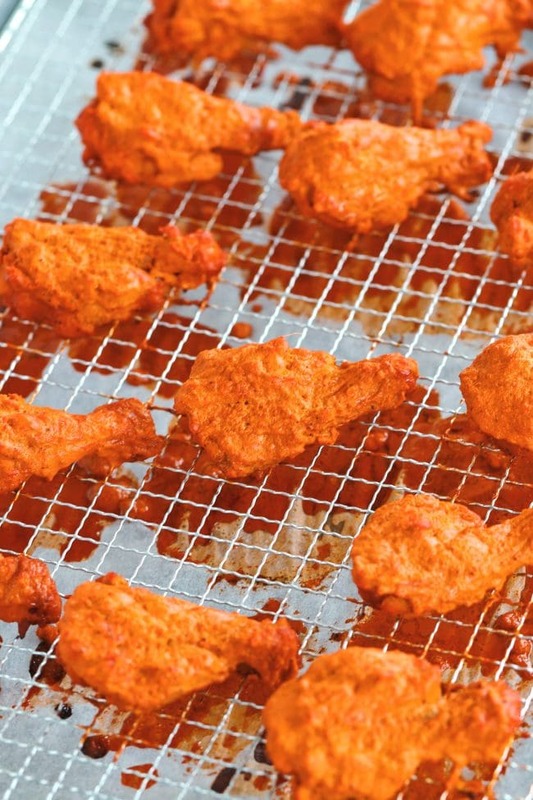 Healthy – since there’s no skin on the chicken or deep-frying with TONS of oil involved. Deeeeee-lish! 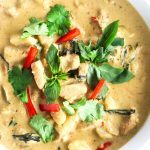 – they are incredibly tasty and loaded with yummy explosive Indian spices and flavors! Multi-purpose & flexible – great as a game day snack, appetizer for house parties, and as a main dish if you pair it with a nice salad with a lemon dressing and some steamed rice or naan! Pretty! 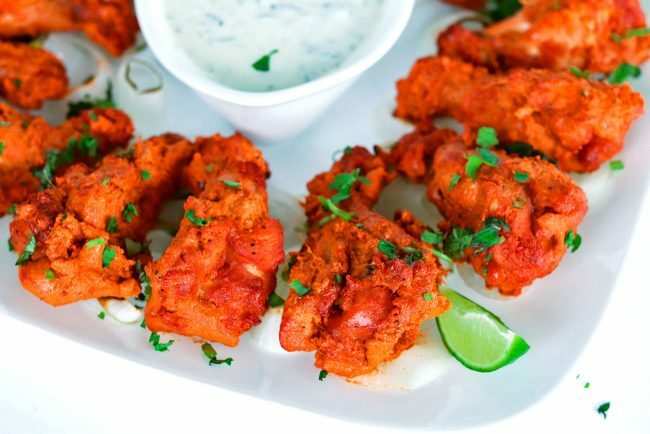 – the vibrant orange Tandoori color makes them look fancy, exotic, and downright irresistible! 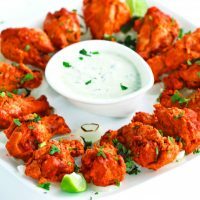 Most likely, you’ve probably tried Chicken Tikka at an Indian restaurant or have at least seen it on their menu. 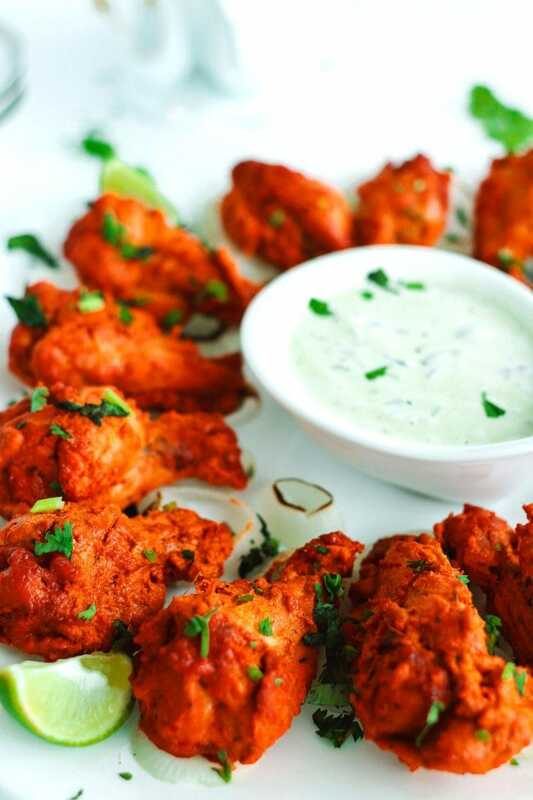 Chicken Tikka is a dish with bright flavors and color (thanks to Tandoori color powder – aka India’s answer to red food coloring). 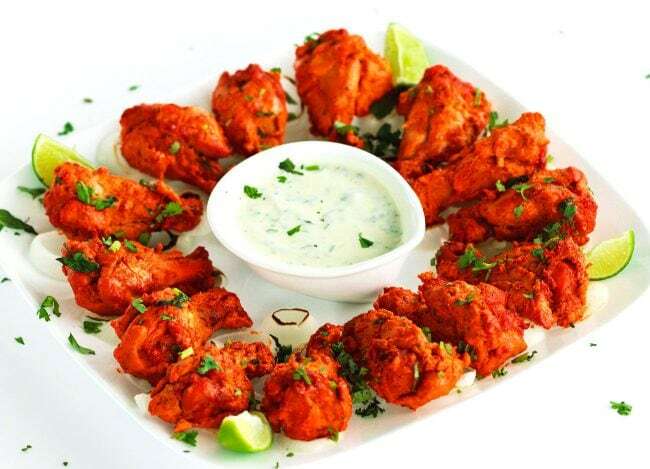 To make chicken tikka, the chicken pieces are first marinated in spices, aromatics, and yogurt. They are then grilled in a Tandoor oven, which is a cylinder shaped oven made of metal or clay. Its heat source is usually a charcoal or wood fire under it, and this allows the food to cook /“grill” inside the Tandoor oven. 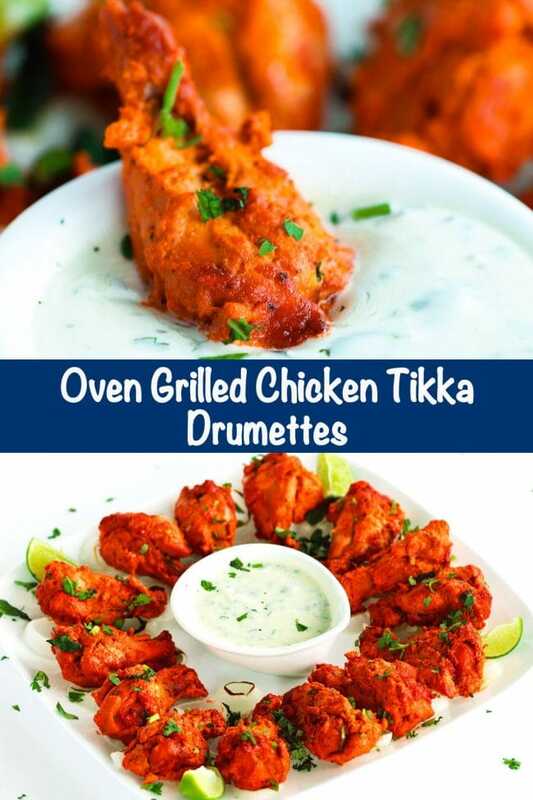 But not to worry – you don’t need a Tandoor oven to make these wonderful Chicken Tikka drumettes. I don’t own one, or even have a proper barbecue grill at home for that matter! But I do have an oven in my apartment. And it does have a broiler and grill setting! 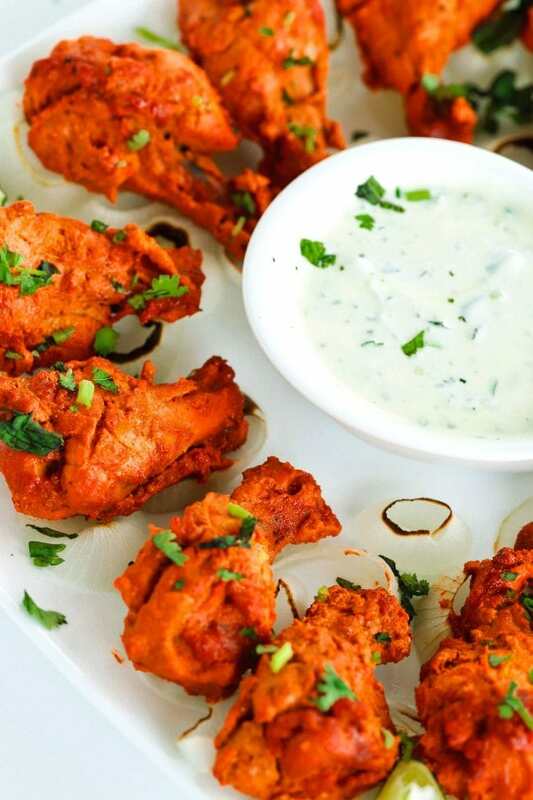 I came up with a twist on this Indian classic dish and turned it into finger food. That is to say, I used chicken drumettes instead of chicken chunks and cooked them in the oven instead of a Tandoor oven. 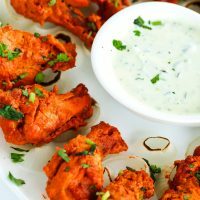 So for the next game day gathering you host, why not shake things up and serve these Indian chicken wings instead of your typical Buffalo wings? 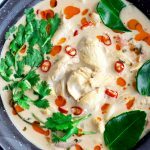 This recipe and method is ridiculously easy to follow and make, and quick too if you marinate the chicken drumettes the day before you cook them! First, combine all the ingredients for the marinade in a blender jug. Blend until everything is nice and smooth. Then line them up on a wire rack and bake in the oven for 25-30 minutes at 180°C/356°F/Gas mark 4. 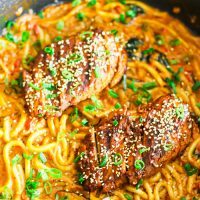 Then crank up the heat by turning on the broiler or grill setting in your oven, and cook the chicken for a few minutes longer to get that wonderful char effect! Last but not least and for the final touch, garnish with freshly chopped coriander and mint leaves! I’ve been obsessed ever since the first time I made them, and have been enjoying these juicy Oven Grilled Chicken Tikka Drumettes on a bi-weekly basis. I’m currently going through phases of eating them with either just the yogurt dip, or with some steamed rice or naan with a side salad for dinner. No worries! You can use paneer (Indian cottage cheese) cubes in this marinade too. Dice the paneer block into 1 inch pieces and pre-heat the oven to 180°C/356°F/Gas mark 4. Marinate the paneer for 30-45 minutes or overnight for best results. 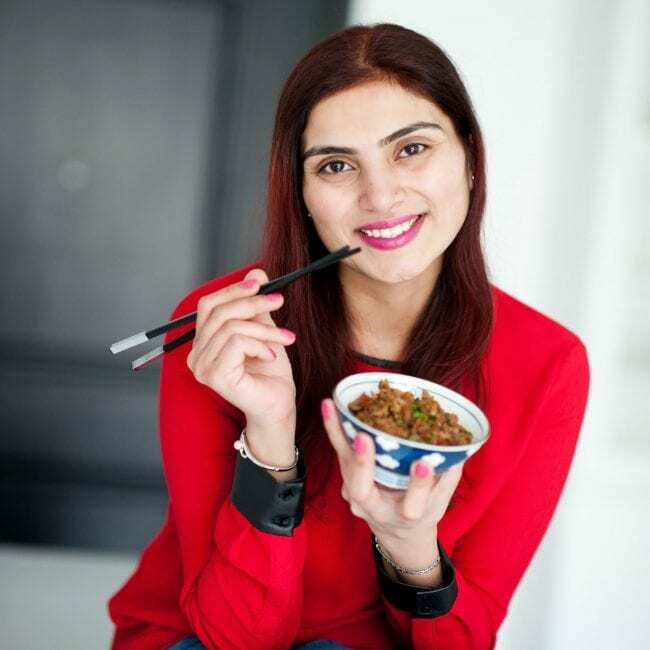 Thread the paneer cubes on skewers (soak for 30 minutes first if using wooden skewers) along with some diced onion and bell pepper if desired – I like using red, yellow, and green bell peppers since it makes it more colorful and tasty! 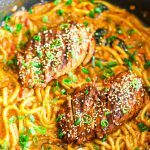 Cook for 15-20 minutes, turning once half way and basting with additional marinade. Then, turn on the broiler setting and broil for 2-5 minutes (while keeping a close watch on the paneer to ensure it doesn’t burn) until the paneer is slightly charred. Garnish with freshly chopped coriander and mint leaves, and serve with the yogurt dip and lime wedges! 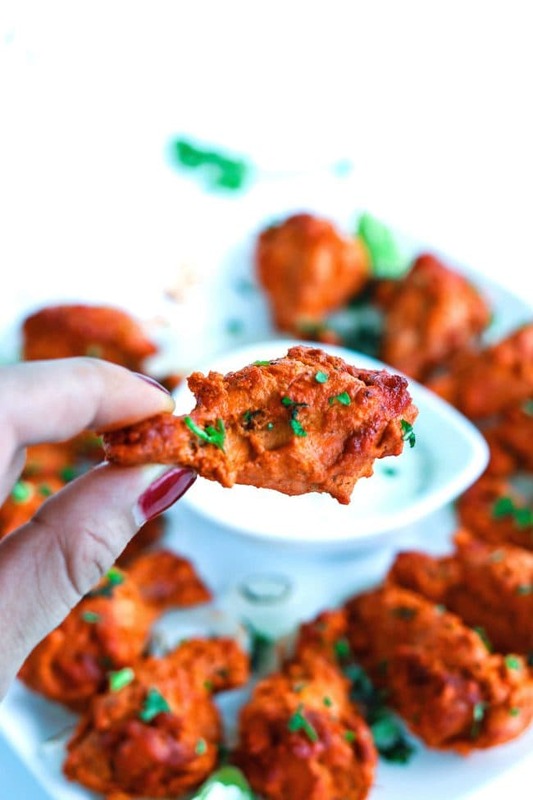 Marinate: In a blender jug, combine the garlic, ginger, red & green chilies, Greek yogurt, black pepper, kosher salt, garam masala, ground cayenne (or Kashmiri red chili powder), lemon juice, tandoori color powder, and water. Blend until smooth. Place the chicken drumettes in a large bowl and pour the marinade over them. Mix with a spoon to ensure the chicken is coated properly with the marinade. Cover with cling wrap and set aside for 30-45 minutes or overnight in the fridge for best results. Cook/Grill: Pop the tray in the oven for 25-30 minutes or until cooked through. 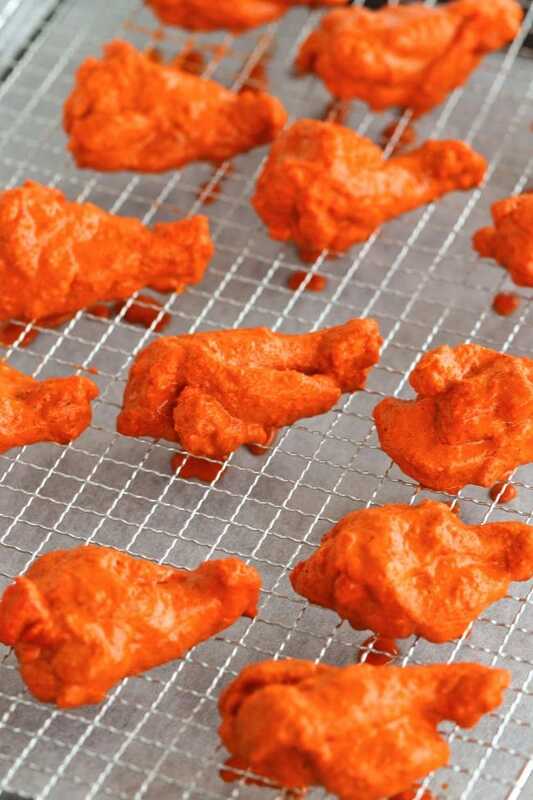 Remove the tray from the oven and use tongs to turn over the chicken drumettes. Baste them with the remaining marinade before popping the tray back into the oven to cook under the broiler/grill setting for 5-6 minutes or until the drumettes’ edges have blackened slightly. Then remove the tray from the oven. (Note: Time may vary due to variations in heating abilities in different ovens. Just don’t walk away from the oven when it’s under the broiler or you’ll end up burning them!). 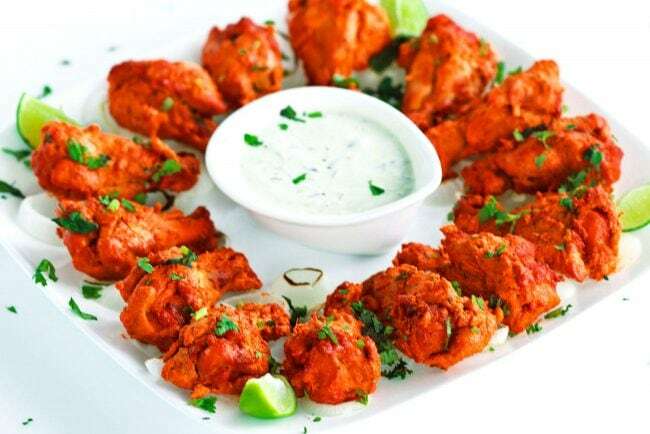 To Serve: Plate the Chicken Tikka Drumettes on a bed of sliced onion rings (you can char them first under the broiler for 7-8 minutes if desired), and garnish with freshly chopped coriander and mint leaves. Serve with some Cooling Cucumber & Mint Yogurt Dip and lime wedges. Feel free to make this milder or hotter according to your preference by reducing/increasing the amount of fresh red and green chilies as well as Kashmiri red chili powder/ground cayenne. To make ahead, you can marinate the chicken drumettes a day in advance and store in a bowl covered with cling wrap in the fridge. Just take them out of the fridge about 40 minutes to an hour before you cook them in the oven so they can come to room temperature first. Then just cook them as indicated in steps 2 through 4. 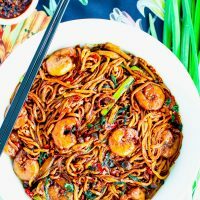 You can serve them with either red or white onion. 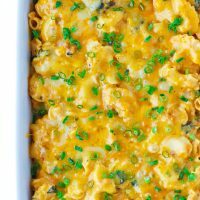 Both taste great, and you can use whichever type of onion you have on hand or prefer. To make the Cooling Cucumber & Mint Yogurt Dip: In a medium sized bowl, combine 1 cup of Greek yogurt, 1 TBLS chopped coriander, 1 TBLS mint leaves, 1 TBLS finely minced cucumber, 1 TSP lemon juice, 1/4 TSP Kosher salt (use 1/2 TSP if using table salt) and a pinch of black pepper. Mix with a spoon until fully combined. Garnish with extra coriander and mint leaves if desired. 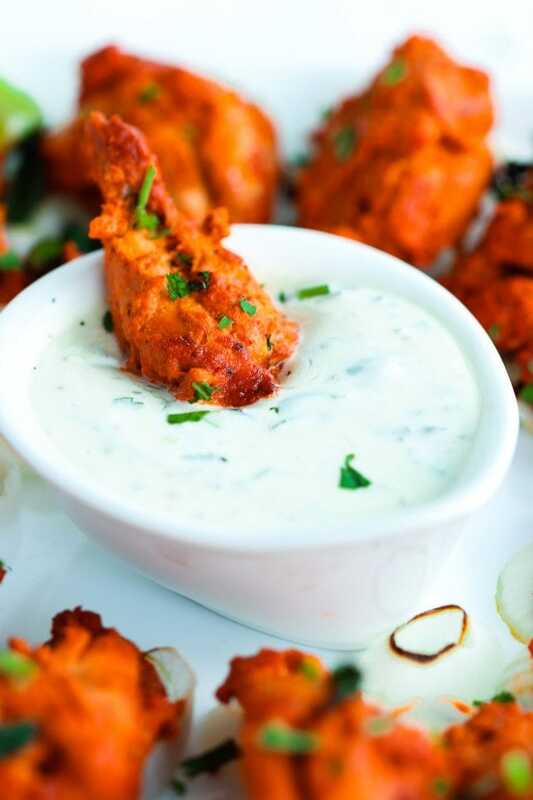 To make this vegetarian, use paneer (Indian cottage cheese) cubes in place of the chicken. Dice the paneer block into 1 inch pieces and pre-heat the oven to 180°C/356°F/Gas mark 4. Marinate the paneer for 30-45 minutes or overnight for best results. Thread the paneer cubes on skewers (soak for 30 minutes first if using wooden skewers) along with some diced onion and bell pepper if desired – I like using red, yellow, and green bell peppers since it makes it more colorful and tasty! Cook for 15-20 minutes, turning once and basting with additional marinade. Then switch on the broiler and broil for 2-5 minutes (while keeping a close watch to ensure that the paneer doesn’t burn) until slightly charred. Garnish with freshly chopped coriander and mint leaves, and serve with the yogurt dip and lime wedges!